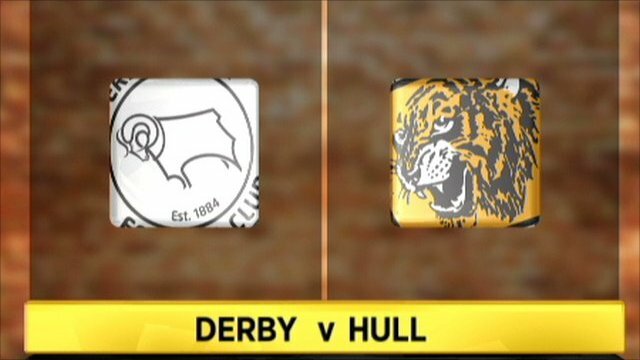 Hull's Championship play-off push maintained its momentum with a first victory at Pride Park as Derby's alarming slump continued. Miles Addison squandered an early header before Daniel Ayala and Jamie Ward did likewise as Derby threatened. Hull responded after the break, Matty Fryatt and Aaron Mclean firing narrowly off target from the edge of the box. But Anthony Gerrard broke the deadlock with a close-range finish from Robert Koren's corner to seal the points. Tigers boss Nigel Pearson saw his side make it nine league games unbeaten and move up to eighth in the table on the strength of only one defeat in their last 18 Championship matches. Derby, by contrast, are without a win in their last eight league outings and have been beaten in six of their last seven home fixtures. Addison nodded off-target early on before former Hull loanee Ayala squandered a chance of his own in the 19th minute. Ward was next to go close with a header just before the break. Derby were forced to replace goalkeeper Stephen Bywater at the start of the second half, with James Severn coming on for his first league appearance for the club. The visitors were obviously keen to test the youngster early on, but Fryatt and Mclean failed to hit the target. That was not the case in the 57th minute when the substitute had to parry a Mclean effort. At the other end, Bradley Guzan produced a similar save to thwart Cywka before Gerrard struck in the 71st minute from Koren's curling delivery. The Rams desperately searched for an equaliser, with Ayala and Ben Davies forcing Guzan into saves in the final 10 minutes. But Hull held out and remain unbeaten on their travels in the Championship since the end of September. 90:00+4:28 The final whistle goes and the game is over. 90:00+3:40 Effort on goal by Theo Robinson from just inside the penalty box goes harmlessly over the target. 90:00+3:14 Theo Robinson takes a shot. 88:59 Ben Davies takes a shot. Bradley Guzan makes a save. 88:06 Ben Davies takes a shot. Bradley Guzan makes a save. 86:01 Tomasz Cywka gives away a free kick for an unfair challenge on Andy Dawson. Andy Dawson takes the direct free kick. 86:01 Substitution Jack Hobbs on for Matt Fryatt. 84:28 Matt Fryatt takes a shot. Save made by John Brayford. 83:16 Shaun Barker concedes a free kick for a foul on Jay Simpson. Free kick taken by Bradley Guzan. 82:26 Daniel Ayala takes a shot. Save made by Bradley Guzan. 82:03 Unfair challenge on Ben Davies by Liam Rosenior results in a free kick. Robbie Savage takes the direct free kick. 82:03 Booking Liam Rosenior is given a yellow card. 80:39 Tomasz Cywka challenges Anthony Gerrard unfairly and gives away a free kick. Bradley Guzan restarts play with the free kick. 79:14 Miles Addison challenges Robert Koren unfairly and gives away a free kick. Bradley Guzan takes the free kick. 78:51 Foul by Jay Simpson on Robbie Savage, free kick awarded. Miles Addison takes the direct free kick. 77:03 Inswinging corner taken from the left by-line by Ben Davies. 76:09 Substitution Ben Pringle replaces Gareth Roberts. 74:36 Outswinging corner taken by Ben Davies, Miles Addison takes a shot. Clearance made by Liam Rosenior. 73:36 Tomasz Cywka gives away a free kick for an unfair challenge on Matt Fryatt. Robert Koren takes the free kick. 73:25 Theo Robinson takes a shot. Blocked by James Chester. 70:57 Corner from the left by-line taken by Robert Koren, Robert Koren provided the assist for the goal. 70:57 GOAL - Anthony Gerrard:Derby 0 - 1 Hull Anthony Gerrard scores a goal from close in to the top right corner of the goal. Derby 0-1 Hull. 69:19 Robbie Savage challenges Matt Fryatt unfairly and gives away a free kick. Robert Koren restarts play with the free kick. 67:20 Substitution Nick Barmby on for Aaron Mclean. 66:17 Free kick awarded for an unfair challenge on Aaron Mclean by Jamie Ward. Bradley Guzan takes the direct free kick. 65:42 Tomasz Cywka takes a shot. Robert Koren gets a block in. 65:24 Inswinging corner taken by Ben Davies from the left by-line, Robert Koren makes a clearance. 65:13 Tomasz Cywka takes a shot. James Chester manages to make a clearance. 64:47 Jamie Ward takes a shot. Save by Bradley Guzan. 63:16 Unfair challenge on Jay Simpson by Ben Davies results in a free kick. Anthony Gerrard takes the free kick. 63:16 Substitution Steve Davies leaves the field to be replaced by Theo Robinson. 62:14 Corner taken left-footed by Andy Dawson, clearance made by Steve Davies. 61:02 Shot on goal by James Harper from long range goes harmlessly over the target. 59:33 Steve Davies takes a shot. Blocked by James Chester. Correction - 58:14 James Harper takes a shot. 58:14 Corry Evans takes a shot. 57:37 Robert Koren takes a shot. Blocked by Shaun Barker. 57:06 Unfair challenge on Matt Fryatt by John Brayford results in a free kick. Andy Dawson crosses the ball in from the free kick. 56:20 Aaron Mclean takes a shot. Save made by James Severn. 55:25 Corner taken right-footed by Robert Koren, clearance by Miles Addison. 52:31 The ball is crossed by Tomasz Cywka, clearance by Liam Rosenior. 51:54 Ben Davies takes a outswinging corner. 50:40 Corner from the right by-line taken by Ben Davies, Bradley Guzan makes a save. 50:08 Liam Rosenior challenges Ben Davies unfairly and gives away a free kick. Gareth Roberts takes the direct free kick. 48:03 Free kick awarded for an unfair challenge on Gareth Roberts by Aaron Mclean. Direct free kick taken by Gareth Roberts. 47:28 Effort from inside the area by Aaron Mclean misses to the left of the goal. 47:11 Aaron Mclean takes a shot. Blocked by Shaun Barker. 46:11 Substitution James Severn joins the action as a substitute, replacing Stephen Bywater. 45:21 Matt Fryatt takes a shot from inside the box clearing the bar. 45:00+4:34 The referee blows for half time. 45:00+3:18 Inswinging corner taken from the left by-line by Robert Koren, Foul by Aaron Mclean on Miles Addison, free kick awarded. John Brayford takes the direct free kick. 45:00+3:06 Corner taken by Robert Koren from the left by-line played to the near post. 45:00+0:46 Free kick awarded for an unfair challenge on Matt Fryatt by John Brayford. Andy Dawson takes the direct free kick. 44:50 The assistant referee flags for offside against Matt Fryatt. Stephen Bywater restarts play with the free kick. 43:46 Steve Davies gives away a free kick for an unfair challenge on Robert Koren. Liam Rosenior takes the free kick. 43:18 Aaron Mclean challenges Miles Addison unfairly and gives away a free kick. Free kick taken by Gareth Roberts. 43:18 Booking Aaron Mclean goes into the book for unsporting behaviour. 42:01 Tomasz Cywka concedes a free kick for a foul on Anthony Gerrard. Bradley Guzan restarts play with the free kick. 40:19 Substitution Jay Simpson is brought on as a substitute for Tijani Belaid. 39:09 Aaron Mclean challenges Gareth Roberts unfairly and gives away a free kick. Direct free kick taken by Gareth Roberts. 38:21 Steve Davies is flagged offside by the assistant referee. Bradley Guzan takes the indirect free kick. 37:34 Jamie Ward has a header from deep inside the six-yard box and clears the crossbar. 37:11 Jamie Ward takes a shot. Anthony Gerrard gets a block in. 36:06 The assistant referee flags for offside against Steve Davies. Indirect free kick taken by Bradley Guzan. 35:51 John Brayford has an effort at goal. 35:17 Unfair challenge on Steve Davies by James Harper results in a free kick. Free kick taken by Robbie Savage. 31:41 Ben Davies fouled by Corry Evans, the ref awards a free kick. Free kick taken by Ben Davies. 30:26 Unfair challenge on Robert Koren by Miles Addison results in a free kick. Liam Rosenior restarts play with the free kick. 29:31 Booking The referee shows Robbie Savage a yellow card for unsporting behaviour. 29:08 Robbie Savage concedes a free kick for a foul on Aaron Mclean. James Chester restarts play with the free kick. 28:44 Gareth Roberts crosses the ball, Anthony Gerrard manages to make a clearance. 27:27 Robert Koren takes a shot. Blocked by Miles Addison. 25:35 Unfair challenge on Daniel Ayala by Anthony Gerrard results in a free kick. Daniel Ayala takes the direct free kick. 24:45 Jamie Ward produces a right-footed shot from inside the area that clears the bar. 23:53 Aaron Mclean challenges Ben Davies unfairly and gives away a free kick. Gareth Roberts takes the free kick. 22:58 Steve Davies gives away a free kick for an unfair challenge on Andy Dawson. Andy Dawson takes the direct free kick. 22:02 Tijani Belaid challenges Robbie Savage unfairly and gives away a free kick. Direct free kick taken by Stephen Bywater. 22:02 Booking Booking for Tijani Belaid. 21:01 Free kick awarded for a foul by Miles Addison on Corry Evans. Corry Evans takes the direct free kick. 20:20 The assistant referee signals for offside against Matt Fryatt. Free kick taken by Stephen Bywater. 20:04 Ben Davies gives away a free kick for an unfair challenge on James Harper. Corry Evans takes the direct free kick. 18:48 Corner from the left by-line taken by Ben Davies, Daniel Ayala has a header from deep inside the six-yard box and clears the crossbar. 18:42 John Brayford delivers the ball, clearance by James Harper. 8:45 Free kick awarded for a foul by Tomasz Cywka on Andy Dawson. Bradley Guzan takes the direct free kick. 6:50 Header by Miles Addison from deep inside the penalty area misses to the left of the target. 6:11 Unfair challenge on Tomasz Cywka by Corry Evans results in a free kick. Ben Davies takes the free kick. 1:45 Unfair challenge on Andy Dawson by Jamie Ward results in a free kick. Free kick taken by Bradley Guzan. 1:12 Outswinging corner taken right-footed by Ben Davies from the right by-line. 0:06 Tomasz Cywka produces a left-footed shot from just outside the area that goes harmlessly over the bar.